This technique allowed for fast, art-directable creation of highly detailed gas simulation, making it easier for the artist to control the appearance of these effects in the final image. AMPAS, "9 Scientific And Technical Achievements To Be Honored With Academy Awards"
Inside Science, "Oscar Sci-Tech Awards Honor Ingenious Screen Science And Engineering"
Inside Science, "Trivia: The Oscar's Sci-Tech Awards"
NSF, "Computer Scientists Win Academy Award for Technical Achievement in Special Effects"
Scientific American, "Oscars Honor Ingenious Screen Engineering"
FX podcast, "Sci-Tech Oscars: technical coolness"
Cornell Chronicle, "Cornell graphics researchers receive Academy Awards for technical achievement"
Cornell Daily Sun, "C.U. 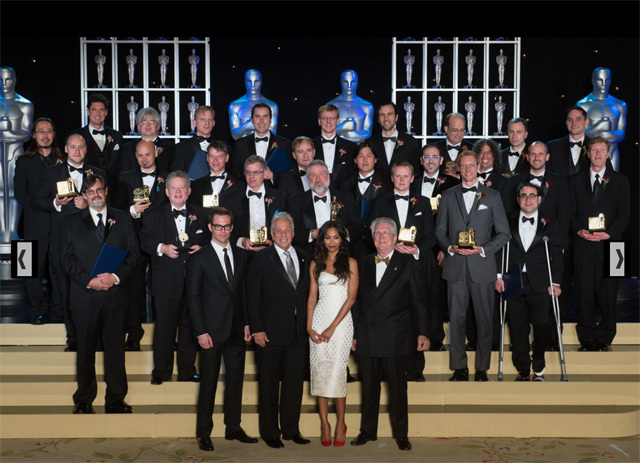 Computer Scientists Win Oscars"
ETH Life, "Oscar-worthy smoke signals"
KCLU, "UCSB Researcher To Receive Academy Award For Technical Innovation"
UCSB, "UC Santa Barbara Researcher to Receive Academy Award for Technical Achievement"
UCSB, "UCSB Researcher Theodore Kim Thanks Academy Awards ‘For This Great Honor"
Santa Barbara Independent, "Oscar Going to UCSB Prof for Special Effects Work"
Santa Barbara News Press, "UCSB researcher wins Oscar for digital smoke process"
The Bottom Line, "Media Arts and Technologies Professor Theodore Kim Receives Academy Award"
Daily Nexus, "Professor Receives Academy Award for Innovative Visual Effect Technique"
KPCC, "Oscar's Nerdy Cousin: Honoring the scientific and technical geniuses who make movie magic"
KEYT, "UC Santa Barbara professor wins Academy Award"
Discovery Channel, DailyPlanet "Goes Hollywood"
CTV, "Software developers from Canada win Oscars for technical achievement"
CBC, "Tech achievement Oscar goes to Canadian software developers"
CBC, "Oscar-winning Canadian technology now an industry standard"
CTV News, "Canadian presence shines during this year's Oscars"
heise online, "Technical Oscar for German Smoke experts"
Digital Production, "Technical Oscar for smoke and CGI"
Nurnberger Zeitung, "Fantasy film `Avatar' has roots in Erlangen"